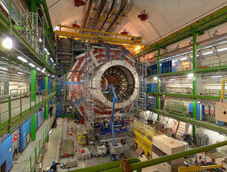 Geneva, SZ—The Large Hadron Collider (LHC) is under siege at this hour. Spurred on by events in Tunisia and Egypt, billions and billions of subatomic particles have gathered outside the facility to protest the murder and unfair treatment of subatomic life. Many even blame the accelerator’s initial technical problems on such miniscule dissidents. One con-CERN-ing possibility involves the offspring of a futuristic subatomic particle actually going back in time to sabotage the collider. More on the Terminator Particle theory here. Spanning across the width of a pinhead, protestors at LHC hoisted tiny signs that read Life Begins in our Interstellar Nurseries and Star Stuff is People Too. One quark had a sign that read Don’t Tread on Me or Bombard Me at Near Light Speeds, MFs! Some even compared NASA’s head, Charles Bolden, to Hitler.